With Northern Illinois’ blue-eyed husky mascot Diesel retiring after nine years on the sidelines, new mascot Mission has a hard act to follow. But it looks like the 2-year-old husky’s cute enough to handle it. 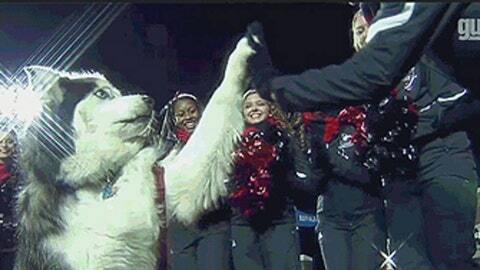 Diesel ”has become the face of Huskie football,” the school’s athletic director, Sean Frazier, said last month when the 10-year-old was honored and named ”mascot emeritus." Plus the dog does this. For Mission, it’s a good time to be top dog. The Huskies, ranked 14th in the BCS standings, remain unbeaten and are hoping for a second consecutive BCS bid. They are among the national leaders with 42.8 points per game and have a darkhorse Heisman Trophy contender in versatile quarterback Jordan Lynch, who set the FBS single-game rushing record for a quarterback with 316 yards on Oct. 19, then broke it last Tuesday with 321. "Jordan Lynch is the best player in college football and that’s no disrespect to anyone else," said Western Michigan coach P.J. Fleck, a former NIU receiver and assistant coach. "The reason is he makes every single guy around him better. He is what Northern Illinois is about. … And with all the pressure, he continues to perform." NIU goes for a third straight conference title Friday night against Bowling Green in the Mid-American championship game at Ford Field in Detroit. After becoming the first MAC school to earn a BCS bowl bid in 2012, Northern Illinois (12-0, 8-0) appears to be in good position to do it again with a victory. Joining Florida State and Ohio State as the only undefeated teams in the FBS, the Huskies are 14th in the BCS standings, and as a member of a non-automatic qualifying conference could earn a BCS bid by finishing in the top 12 of Sunday’s final standings. As was the case last year, NIU also can earn a bid by finishing in the top 16 and ahead of an AQ-conference champion. The Huskies currently are two spots ahead of Central Florida, which is in line to receive the American Athletic Conference’s automatic bid. They’re looking to extend their FBS-best win streak over league opponents to 26 games and join Marshall (1997-2000) as the only schools to win three straight MAC title games.